Lent caught me flat footed this year. I was in the produce aisle at Wal-Mart, looking for onions when I noticed the heavy ash cross on the forehead of another shopper. This year has been so different. Our household, never “normal” by any standard, has been crazy, so “un-normal” even for us, that I’ve heard myself asking The Father if He could please bless us with an “ordinary” day. One that is unmarked by weather and sickness. It has been over two weeks since the schedule at our house has been right. I find it so hard when I cannot count on a schedule to practice the disciplines I need for sanity and Godliness. It isn’t that I lose my Salvation, as much as it is that I feel very vulnerable to wrong attitudes; jealousy, suspicion, impatience, indifference, sadness and self pity rear their ugly heads and wreak havoc with my head and heart. Faith seems like a slippery slope and it is so easy to see all the places where Christians are unloving, unreliable, unthinking, or just plain rude. And so, I came to the season of Lent with some very late resolves. It dawned on my fur brain tonight that Easter is 30 days away. For about 5 days, Youngest Daughter and I have been trying to observe a Lenten fast from candy, cookies, cakes and pies. I’ve been saying during these last five days that we were going to do this the last 30 days of Lent, not realizing that we actually had 35 days left. But I’ve messed up in these last two days. with Doughnuts for the snow day, and Apple Dumplings for the Quiz Team Fundraiser today. (I mean, it wouldn’t be supportive not to at least eat one in honor of all their hard work, now would it???) And I thought about how easily I make excuses and think that this once won’t matter, and so, the days slip on by. 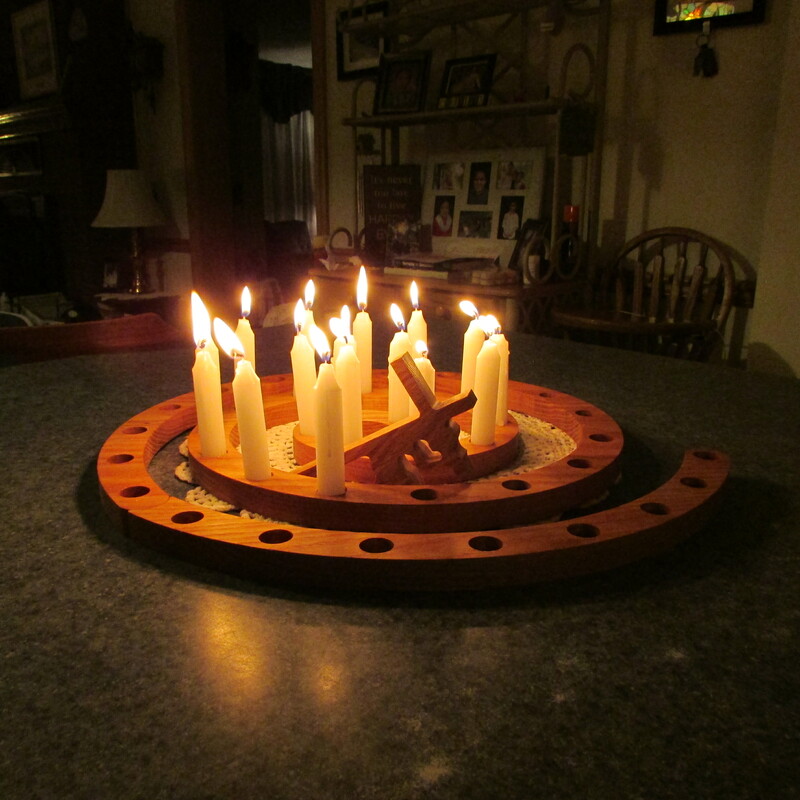 Some years back, I purchased an advent/lent wooden “path” (with appropriate markers and extensions for the journeys) from Author Ann Voskamp’s son, Caleb. We’ve used it often in the seasons since, and this year, I’ve staked the days with candles that I bought from the Jewish section of the grocery store. I started at the outside edge and was working my way to the inside. The figure of Jesus, carrying his cross, made its way steadily along the path that was getting narrower and narrower. And then Middle Daughter, looking at my Lenten Journey display, made this observation. That really impacted me.. For one thing, this business of denying self and taking up our cross, while it is something that we are commanded to do, it is not supposed to be introspective. Too often, I do this for me. It’s supposed to be all about Jesus. All about Him being so big and good and Holy that we disregard what we think we want, to focus more on Him, to “get him out” of the boxes we’ve put Him in, out of the confines of our little circles to a world that needs the hope of a Savior who loved them enough to die. The thing is, when we, for whatever reason, or by whatever means, think we need to keep Jesus in our little world, we are really missing out on seeing Him, knowing Him, honoring Him.